Bringing Pardot Marketing Automation into your organisation’s Salesforce setup is a great move – you are going to find that you have all the functionality you could ever have wanted for your marketing, right at your fingertips. Messages will go to the right people at just the right time. Prospects will be nurtured automatically through each stage of the buying cycle. Your intelligent deployment of marketing effort will bring you data-driven insight at a granular level. In short, this is largely about taxonomy: a chance to organise the important information and categorise like a true professional. Remember when you implemented Salesforce and you had to clearly think through your business objectives, hierarchy of information, naming conventions and processes? All of this applies to setting up Pardot too. So while it’s possible to get Pardot up and running as an MVP and fire out your first email in a matter of days, you will have missed a golden opportunity to set the platform in a way that is going to really drive results and that you can much more effectively build upon. Get it right at the beginning however, and you are way ahead of the game. You’ll see better usage across your department, better results in relation to your objectives and more ROI from your licence fees. The problem, how do you know how to set up a system, before you know the system? Against each of these objectives, take a baseline and document it – that’s what you are measuring your progress against. Final point, your objectives can change over the course of the year, to cope with extraordinary circumstances (case in point: GDPR) and that’s perfectly OK. The thing about Pardot, is that the more you learn about the platform the more you will want to do. Setting out your initial objectives will keep you focused rather than disappearing down a rabbit warren of functionality. Marketing Automation is a new tool, it’s not a new methodology. Everything you already know about creating great content that grabs attention, generates interest, builds desire, provides evidence and finally gets action, it’s all still relevant. You just now have the chance to serve this content up in a much more effective way. Divide your content up into categories, not just on the basis of product or service, but cross-referenced against each stage of the buying decision process. Now, plot out how you see that each piece of content leading to the next, until you reach the outcome you want. Start with the basic journeys you need and over time, you will get more sophisticated. The word ‘Campaign’ is a truly tricky one in the marketing lexicon. If you’ve been working on Salesforce for a while, then you’ll be of the mindset that leads and contacts can belong in multiple Campaigns. In Pardot, it’s a different story* – your Prospect will only belong to one Campaign, and that’s their first touch. Now think about the different variables in this marketing effort and the hierarchy of information on which you could categorise your Campaign e.g. The options available to you are endless, and therein lies the problem. Whether complex or simple, pick one system that works for your business model and stick to it. Don’t forget, there are many other options to segment prospects and assets via Lists, Tags and Folders, so don’t be afraid to bucket your Campaigns at the higher tiers of information. *Salesforce Campaigns and Pardot Campaigns can now be synched in fact, as a nod to making the two platforms more aligned. Big topic. I will try to narrow this down. Essentially, every time you create something in Pardot – whether that’s a List, a Custom Redirect, an Engagement Programme – you’ll need to name it and link it to a Campaign. So the sensible, documented naming convention you set up for your Campaign structure will help you here. Tip: Have a play with this Pardot Naming Convention tool. Once you have that worked out, make sure you share it with the rest of your marketing team. It’s a headache, I agree, not as big a headache as putting in a naming convention further down the line. Scoring leads is the magic ingredient in Marketing Automation. Except it’s not magic, it is strictly logic, and setting up that logic is down to you. When you first set up Pardot, there is a default scoring model in place, but it makes sense to set your own rules up as soon as you kick off. Again, it’s time to make a list. List all the actions that a Prospect might take that would signify positive or negative buying behaviour. Now sort it from the clearest buying signal to the least and add some scores. The actual figure is arbitrary, this is a weighting game – high score = hot prospect, low score = needs warming up. Tip: Use the default Scoring Categories as the starting point for your list. Lots more to say on Scoring (Folders/ Multiple Scoring Categories etc). But for now, put in place a first pass at a scoring system. You can always iterate on this starting point. Everyone who works in marketing has heard this term. While 2018 was mainly about retro-fitting GDPR to existing marketing assets and mechanics, getting started on Marketing Automation is your chance to make for a fully compliant future for your data. Along with your website privacy statement, your Pardot Email Preference Centre will become your best friend and I fully encourage you to make this the first asset you set up in Pardot. You’ll need these two pieces in place for everything you do from now on. One more thing, make sure you test whether or not cookie consent pop-up is fully operational. If not, you don’t have permission to track your visitors and prospects and that’s not really the point of purchasing sophisticated marketing automation technology. A little further down the line, when you come to set up automation rules to keep you compliant (quite possibly in the form of an Engagement Journey), you will already have the basis of these rules laid out as the terms of your privacy statement. Each of these headings above is a story in itself and there are plenty of further resources you can read around each of these topics. However, if you are currently preparing yourself for Pardot, I would strongly suggest that this is your starting point to absolutely ace-ing your implementation first time around. The other bit of good news is that with just a bit of additional upfront thinking, it’s well within your grasp. I will be delivering a breakout session on this topic at the B2B Get Stacked 2019 Conference on 2019 March, London. Come along, I’d love to see you there! 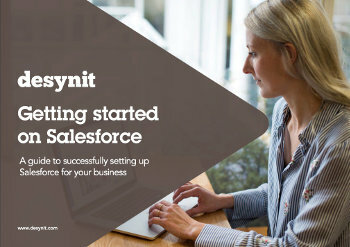 Desynit work with clients to implement and optimise Pardot, check out our Pardot Best Start service here.